Today, I've got some really special gardens for you on my alphabet tour! 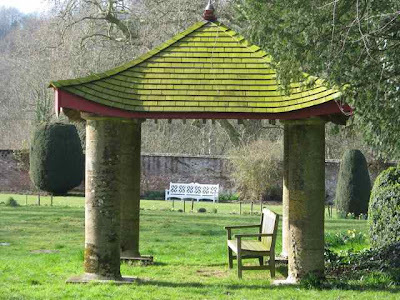 From Forde Abbey in Dorset to Greenbank Garden in Scotland - they are all favourites of mine - and places that I return to whenever I am in the area. Forde, a former Cistercian abbey (above), started in the 12th century, has wonderful grounds extending to more than 30 acres, complete with lime and walnut avenues, a large lake and a backdrop of stately buildings; plus impressive bog and walled kitchen gardens. There is something enchanting about this place, dotted with statues and sculptures, and you'll enjoy a remarkable sense of peace when you're walking around. 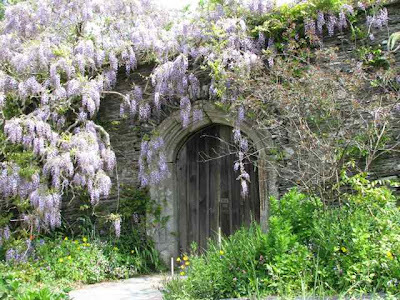 Open year round, and really spectacular in February with its displays of crocuses and daffodils. The Garden House, which I reviewed earlier this year, is another great favourite of mine and is home to a ruined abbey, which makes a wonderful backdrop to the gardens. The creation of a retired schoolmaster - Lionel Fortescue - it is a plantsman's paradise - filled to bursting with interesting plants and divided into a series of large garden "rooms" featuring South African, meadow, bulb and magnificent tree collections. There is always something to see here and the only sadness is that it has become so popular that it can be hugely crowded. 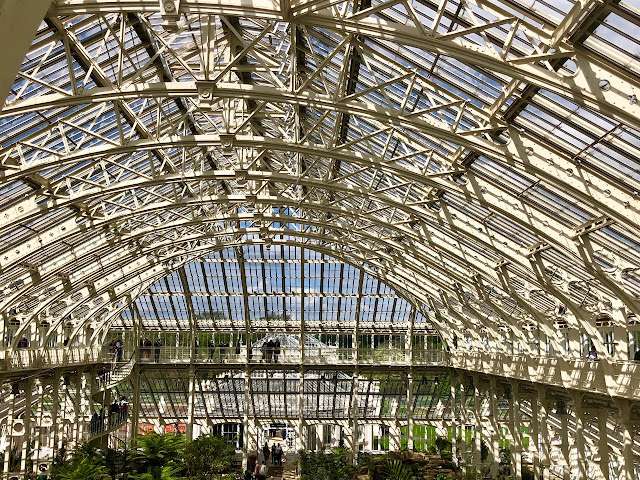 I'm being a little unfair including the next garden - Glen Chantry - because it's no longer open to the public. The owners closed their doors last summer after 30 years of receiving visitors, although I understand they will continue to open for charity in 2010. So check the web if you plan to visit and see if they plan to open - you won't be disappointed. Planting here is magnificent; the borders will stop you in your tracks; and then there are the stunning little touches like this lady, made out of chicken wire! Great Dixter (above) seems to be on everybody's wish list, which is hardly surprising because it is an iconic landscape with its staggering floral displays and ancient timber-framed house as a backdrop. 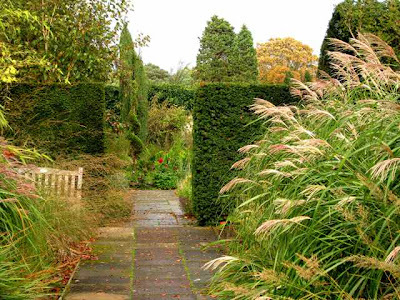 Former home of Christopher Lloyd, this is a garden with a difference! It's stunning and well worth going out of your way for. Gorgeous Greenbank Garden (above) may be a little out of the way, but could form the basis of a Scottish garden tour because there are so many other lovely gardens nearby. 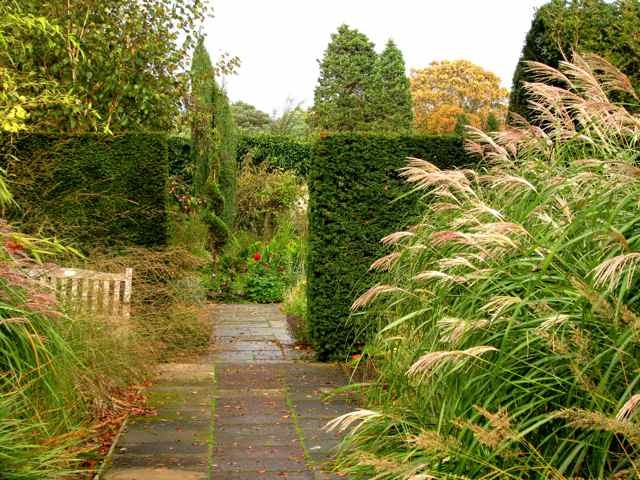 This stunning 2.5-acre walled garden is divided into many sections and demonstrates design and planting ideas for small gardens. You will see many interesting plant combinations and colours here. 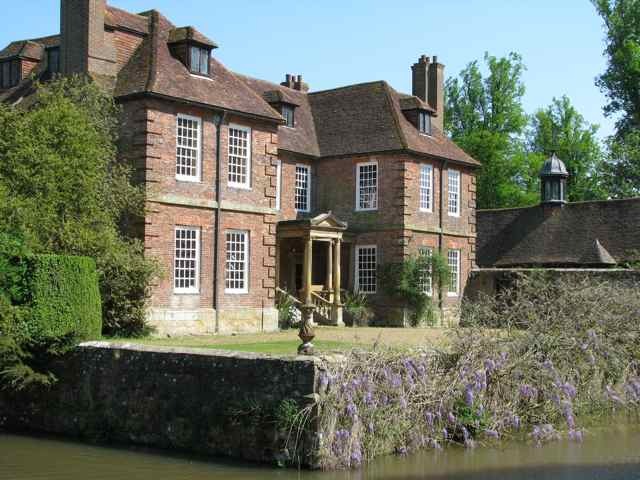 And finally, Groombridge Place in Kent (above). An interesting restored 17th century garden with its "drunken" juniper trees, handsomely moated manor house (not open to the public), and newer features like the giant chessboard, the Golden Key Maze and a charming knot garden. There is also an enchanted forest for children. The setting of the property is quite spectacular in a broad wooded valley, and it is very peaceful here. So beautifully enchanting! I always love your posts..they transport me into a magical world! Thankyou! beautiful photos! These places are so relaxing! I just read Kiki's comment above. Did my eye see those words, did I read it and forget that I did, or were Kiki and I seperated at birth? 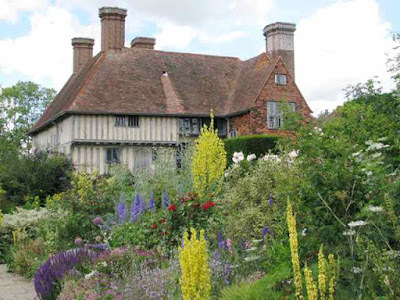 I am so pleased to see Dixter here, such a special Kent garden, not only for its visual beauty but because the philosophy of the creators shines through. Thank you for the wonderful pictures. What beautiful gardens. 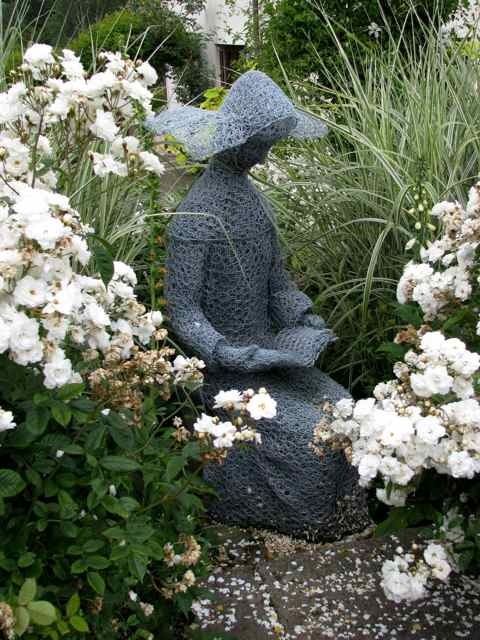 I love the lady made out of chickenwire. I am looking forward to "H" & "I". These really are spectacular places. I can't imagine what it must be like for you to enjoy visiting such wonderful gardens. These are lovely, thank you for sharing them. 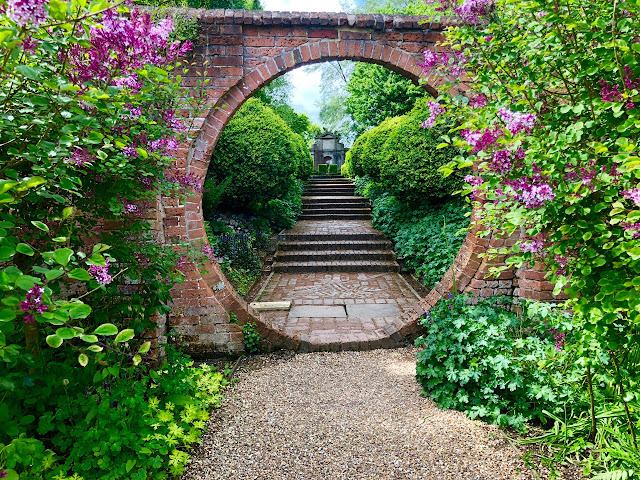 Charlotte you so capture the beauty of these gardens I am looking forward to that book.